This book is for social scientists, medical and pharmaceutical researchers, professors and students in quantitative fields, data analysts, data mining specialists, and statistical programmers who have a sense of what they want to do, but not how to do it in R.
R is a powerful language for statistical computing and graphics that can handle virtually any data-crunching task. It runs on all important platforms and provides thousands of useful specialized modules and utilities. This makes R a great way to get meaningful information from mountains of raw data. 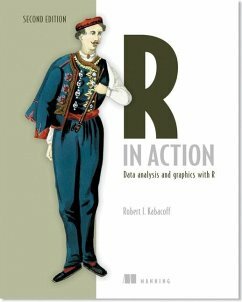 R in Action, Second Edition is language tutorial focused on practical problems. Written by a research methodologist, it takes a direct and modular approach to quickly give readers the information they need to produce useful results. Focusing on realistic data analyses and a comprehensive integration of graphics, it follows the steps that real data analysts use to acquire their data, get it into shape, analyze it, and produce meaningful results that they can provide to clients.